View to the NE of the Taos valley and Sangre de Cristo Mountains. 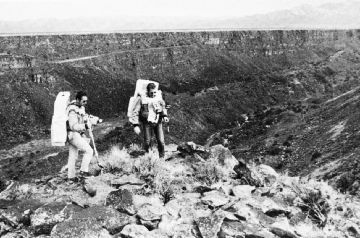 Apollo Astronauts Jim Irwin (left) and Dave Scott (right) on a geological field trip to the Taos plateau, led by Bill Muehlberger in 1971. Irwin and Scott later landed near Hadley Rille (a volcanic channel) on Apollo 15, where they performed geologic investigations of the lunar surface. They collected 370 rock and soil samples, including a core from 2.4m below the surface. At 1.5km wide and 300m deep, Hadley Rille is comparable to the Rio Grande gorge near Taos. For several years, Paul Bauer (NMBGMR) has been leading an effort designed to characterize the geology of the Taos Valley. The first phase of the project, funded by the USGS STATEMAP Program, consisted of detailed geologic mapping by Bauer and Keith Kelson (W. Lettis & Assoc., Inc.). The mapping has revealed much about the surface distribution of faults, the paleoseismicity of the Embudo and Sangre de Cristo fault systems, the nature of the basin/mountain interface, and the stratigraphic and structural history of that part of the Rio Grande rift. Due to recent concerns about ground-water quantity and quality for the area's expanding population, the New Mexico Office of the State Engineer provided funding to Peggy Johnson (NMBGMR, now retired) and Paul Bauer to study the hydrogeology of a portion of the valley. In the final technical report (Bauer et al., 1999), it was noted that, due to inadequate borehole and geophysical data, we could not provide well-constrained 3-D geologic models of the basin. We recommended that a detailed gravity survey be run, and proceeded to plan such a survey. Late in 1999, Dr. Patricia Dickerson (Lockheed Martin, for Office of Earth Sciences, JSC/NASA) was looking for a field exercise to train astronaut candidates in geophysical planetary exploration techniques, in anticipation of the upcoming human missions to Mars and the Moon. Dr. William Muehlberger (UT Austin) has been training astronauts in Taos in geologic field methods since the Apollo missions to the moon. The geological and geophysical field exercises are elements of the Earth sciences and remote sensing training provided to astronaut candidates by Office of Earth Sciences at JSC. In January 1999, Dickerson, Bauer, and Muehlberger agreed to cooperatively run four training seminars in May, June, and July 1999 for the current class of 31 Astronaut Candidates. Together, they designed a series of gravity surveys near Taos that resulted in the production of 27 km of new, high quality, gravity survey lines, and an excellent educational experience for the astronauts. After completion of the training exercises, Bureau of Geology personnel collected an additional 29 km of gravity data along lines both parallel and perpendicular to the astronaut lines. Taken together, the two data sets have allowed us to construct a preliminary 3-D gravity map of the area, and more rigorously interpret the subsurface geology. 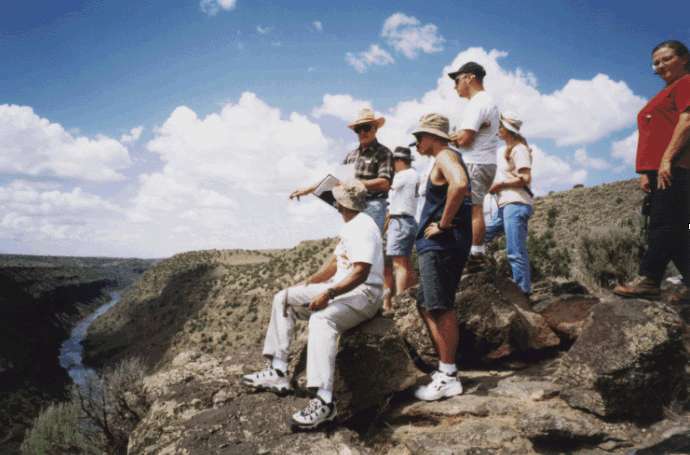 Bill Muehlberger (holding map board) and Pat Dickerson (red shirt) discuss Taos Geology overlooking the spectacular Rio Grande Gorge at the site where Apollo astronauts trained.